Daily Illuminator: We're Making Garbage Pail Kids Games! 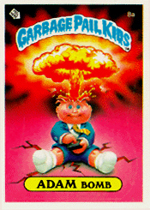 October 10, 2014: We're Making Garbage Pail Kids Games! We've already worked with Topps a couple of times, when we made Munchkin Apocalypse Mars Attacks! and Mars Attacks -- The Dice Game. Well, we're working with them again, but this time we're making Garbage Pail Kids games! At New York Comic Con, October 9, we unveiled Garbage Pail Kids: Super Snot Shots, a limited-edition dexterity game that's as gross as it sounds. It'll be available at NYCC, and on Warehouse 23 while supplies last. But that's not all! In 2015, we're going to release Garbage Pail Kids: Disgusting Dice Game, a brand-new game that uses classic Garbage Pail Kids art, includes custom dice, and will be released in time to celebrate the 30th anniversary of the Garbage Pail Kids trading cards. Gross! Checkout the press release for more info!